Investors who put their faith in Jeff Bezos are being rewarded. Again. Amazon's shares soared 5% to an all-time high Friday after the company reported stellar first-quarter results. So much for President Donald Trump's anti-Bezos/Amazon/Washington Post tweets hurting the company, huh? The Amazon (AMZN) surge helped lift Amazon's market value above $775 billion. Only Apple (AAPL), with a market cap of nearly $820 billion, is worth more. And the net worth of Bezos, already the world's wealthiest person, is now $135 billion, according to Forbes. That's almost $45 billion more than the second-richest person on the planet: Microsoft co-founder Bill Gates. But investors in Amazon weren't the only ones popping champagne corks Friday. Shares of Microsoft (MSFT) and Intel (INTC) also rose after their latest earnings. Microsoft hit a record high too. Despite the strength in tech stocks, the Nasdaq, Dow (which Microsoft and Intel are both part of) and S&P 500 were all slightly lower. Tech earnings have been extremely robust so far this quarter. Google owner Alphabet (GOOGL) reported healthy gains in earnings and revenue, although investors are a little nervous about how much the company is spending. Facebook (FB) posted earnings and sales that blew away forecasts -- a sign that both users and advertisers are not shying away from the social network despite the Cambridge Analytica data scandal. And Netflix (NFLX) also wowed Wall Street, reporting that it now has 125 million subscribers worldwide. Most tech companies have benefited from healthy demand for their products. The recent tax cut in the US is helping lift profits too. Amazon, for example, reported an effective tax rate of just under 15% in the first quarter, compared to a tax rate of 24% a year ago. Matt Schreiber, president and chief investment strategist of WBI Investments, thinks that tech companies are also going to use some of the savings from lower taxes to buy back more stock as well -- a move that will boost earnings per share. 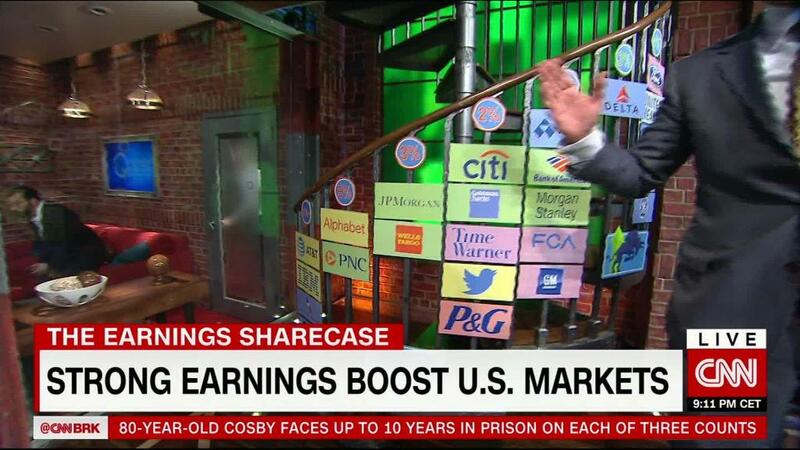 "The big tech companies are awash in cash and have had great earnings," Schreiber said. "Amazon and other tech companies are growing like a stinkweed. The fundamentals are strong." But earnings season is starting to wind down. Apple will release its latest results on May 1. There are growing concerns that iPhone sales -- particularly for the iPhone X -- may disappoint after a big chip supplier for Apple reported sluggish demand. That's a big reason why Apple's stock has lagged the broader market this year. But investors are still in love with tech broadly. The Nasdaq is outperforming the Dow. The strength of Amazon, Netflix and Intel is a big reason why. And two other tech leaders, networking equipment giant Cisco (CSCO) and chip company Nvidia (NVDA), report results in mid-May too. Both stocks are up more than 15% this year.